I'm going to take a minute and start this post out a little differently. This is for all the moms. Lately I've been feeling a little bogged down by trying to be Super Mom. What I've found about Super Mom is that at the end of the day everyone has been cared for except for...you guessed it ...Super Mom. How many of you reading this have constantly pushed any self care to the next day, and the next day, and the next day, only to realize it's been months since you've done anything just for you? I know you can't see right now but I'm raising my hand saying "Me!!!!". Let's all agree to something right now. Make a plan to do something just for you within the next week. However big or small you want. Take a long walk in a park, get a spa treatment, go to a museum, go shopping, make a bubble bath. We need to make sure we get on that to-do list or we realize it's been years since we put ourselves first. 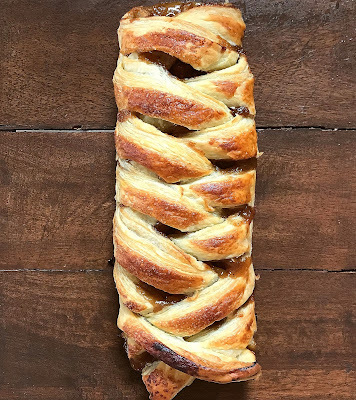 Now, I realize it's bit odd posting a Braided Apple Danish after I just went on a rant about Super Mom. I promise this is easy! And quick! 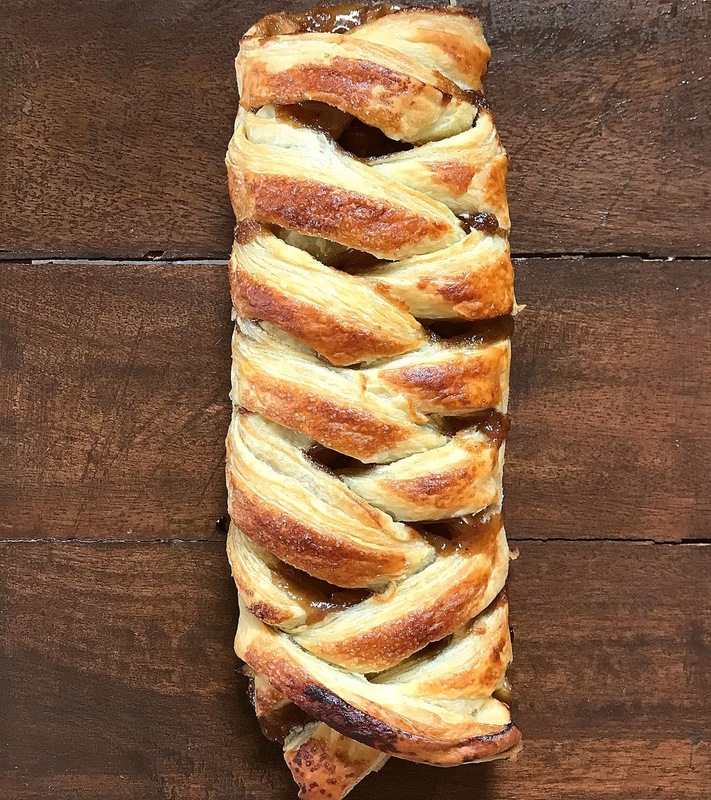 If the braided dough isn't perfect, no big deal. If it comes out seriously screwed up, cut it into slices and no one knows the difference. See? Those are those little tricks of a Super Mom. 1. Heat over to 400 degrees. Defrost the puff pastry on a cookie sheet lined with wax paper. Do not try and unfold it until it has defrosted!! 2. In a saucepan over medium heat, melt the butter, then add the diced apples. In another bowl, combine the brown sugar, cinnamon, nutmeg, salt, and flour. Add this sugar mix to the butter and apples and bring to a boil over a medium-high heat, then reduce to a simmer. Cook about 5-6 minutes until the apples are tender. Remove from heat and allow to cool slightly. 3. Take your defrosted puff pastry and open the folds. To make the braid pieces, make diagonal cuts from the center, out and down. I used a pizza cutter. Click Here to view photos of how to make the cuts. Place all of the apple mixture down the center of the puff pastry. 4. Time to braid! Start with the top left flap and fold down, then the right, and so on, making sure to tuck each flap inside or else when you bake this any stray flap not tucked down and inside is going to puff up (it's called puff pastry after all!). 5. Whisk the egg and water, brush over top all of the exposed dough and sprinkle with the white sugar. Bake 30-35 minutes until golden brown. Do not over bake!